Sorry - Cannon Street. It's the Sugarloaf now. Where's it gone? It's disappeared from the Nicholson's site too. I think this is because they've taken over the O'Neil's on Queen Victoria Street. Been coming here for a few years, good selection of well kept Real Ales, bar staff pretty average for the area - Management though is very good - keep a well stocked cellar and knowledgable about their Ales. Food here is typical pub grub but well cooked and served nicely. Met some friends at Liverpool Street station. 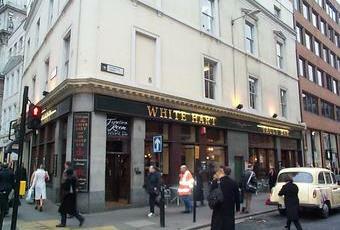 As the Hamilton Hall was packed to the rafters someone suggested this pub. Initially, here was also packed but it emptied out later on. Although six ales were on, three of them - the Tribute, Doom Bar and London Pride - were off. They did put the Pride back on. A pleasant pint. Prices were what you'd expect for the City, just over �3 a pint. Not a bad place, although it did have the crampest (is there such a word?) filthiest bogs I've ever come across.